Rugby is the main sport played at the College during the Winter term. There is an extensive fixture list for all age groups which takes place during the week as well as weekends. 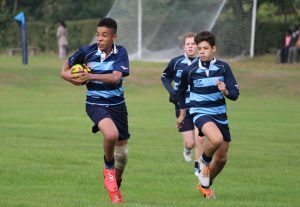 The College also offers extra-curricular rugby during the week to enhance the pupil’s development. After school training is also an option. The College and enters sides into the National Daily Mail Competition at both U15 and U18 level, as well as County Competitions. In the Easter term, year groups are also entered into Rugby Seven’s Tournaments.